As I am getting older, my tolerance levels of being cold have dropped to pretty much zero. I no longer enjoy playing the snowballs or making snowmen as I did when I was small. Instead when it snows, this cheery disposition of mine is quickly replaced by a cautious person who has with age developed a greater awareness of the posing dangers that come with cold weather and snow such as: slips on pavements, dagger like icicles, scraping ice of the cars windscreen and slippery roads. However, I cannot deny its magical morphic abilities and marvel at its beauty. I am sure you will agree that ice, snow is so fascinating. So I hope you won’t mind me sharing some images that have kept me upbeat and made me smile at life over the past couple of months. All photographs have been taken from here. If all this ice has given you the shivers, below is something to warm you up. Beautiful - and I am the same as you - I guess it is because we know how much it hurts if we fall over! 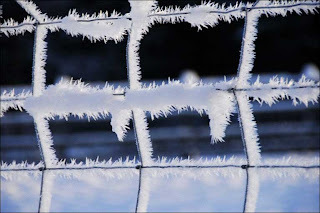 I love the icerose, icicles, frozen cobwebs, icy fence, ice slates and ice clusters (actually these I love the most, as I have never seen anything like this). Snow and ice are deffinately amazing. Such lovely chilling photos! I am rather pleased that the sunshine is (shyly) coming back though! Kella I too was fascinated by the clusters. Absolutely incredible! I too am pleased that the sun is coming through. Your mini garden gnome is discovering the sunshine too. Love his toadstools. Thank you so much Kateri. I am glad you enjoying seeing these. I am glad you enjoyed seeing them as much as I enjoyed sharing these. I too am looking forward to the spring. They really are. Thank you Pam. I am glad your enjoyed looking at them as much as I had. Thank you for coming by Alyssa.